I hope this comes at the time when you need a little Wednesday pick me up. Your path is beautiful and crooked just as it should be. Friends, life takes you down a strange and winding road. Just because you aren’t on task now doesn’t mean you won’t get there. Stay positive and look forward. Time seems to be the killer of all things. We are constantly complaining that there are not enough hours in the day to get everything done, but I don’t believe that. 24 hours in a day is just right. Once you factor everything in: 8 hours of work, an hour commute, grooming, sleeping, eating and exercise, what more do you need? In this day in age, we need to learn how to prioritize. We need to set an agenda and we need to sit to it. Take a look at this post from Sam Davidson. He’s preaching exactly what I am talking about. You will find that 24 hours in a day is just enough when you start to put the clutter behind you. You know what you don’t have time for. Don’t let other people convince you otherwise based on the whims of any given news cycle, their personal agenda, or some prejudiced notion of what you ought to make time for. You don’t have time to discuss Duck Dynasty. You don’t have time for someone else’s poor planning. You don’t have time to fix it, so let’s all get it right the first time. You don’t have time for a distraction brought on by cheap technology. You don’t have time for anything that doesn’t align with what you value, who you love, and where you want to go. There is simply too much good work left to be done. And there are fewer and fewer hours in which to do it. Set the agenda. Don’t let someone else set it for you. I have this beautiful card sitting on my desk. This card is a reminder to do great things. It’s a reminder that life is short and a beautiful thing. I love giving myself challenges. I thrive on challenges. I like giving people challenges. A challenge gives you the brain capacity to think outside of the box. Having a new perspective is what we need every now and again. The other day, Matt was looking through his Instagram feed and someone posted a Photo Challenge for the month of December. Basically, it was a challenge to take a photo every day in the month of December focusing on whatever word or phrase was associated with that day. Matt told me about this insta challenge and I was already interested, as was he, but after we looked at more it, was uninteresting, ie, the words and phrases weren’t as creative. With a challenge on our minds, I came up with the idea to make Matt a list that he had to follow. Matt accepted the challenge. The rules: take one photo based on the word or phrase, post on instagram. The list I gave him is below. Throughout this challenge, I told him that he has 30 days to do it, but the list isn’t associated with particular dates like it was in the last challenge. Sometimes as an artist you need flexible. Matt is six photos deep and he’s really going with this challenge. I appreciate that he is playing along and taking this challenge to heart. If you’re interested in the challenge or the photos he is taking, you can follow along on his Twitter OR on his Insta. It’s not Halloween or even complete without Hocus Pocus. It doesn’t matter if you are quoting the moving, sending .gifs to friends, a themed party or watching the movie—this movie is a must for the Halloween season. Since the first time I saw Hocus Pocus, I had it bad just like Usher. My mom, sister and I would watch this movie countless times during the Halloween season. Set in Salem, Mass., on Halloween, three sister witches were executed in 1693 and revived 300 years later. They try to secure their immortal existence in modern-day Salem, Mass. As a twist, the witches try to remain alive, but only to discover resurrection only lasts through Halloween night unless they capture children and take their life before sunrise. The witches search the city for victims, but in the end the witches are defeated. This film captures the essence of Halloween. The over-the-top personalities of the sisters are timeless. The heart and kindness of the Dani and Thackery Binx allow us to know everything will be alight in the end. 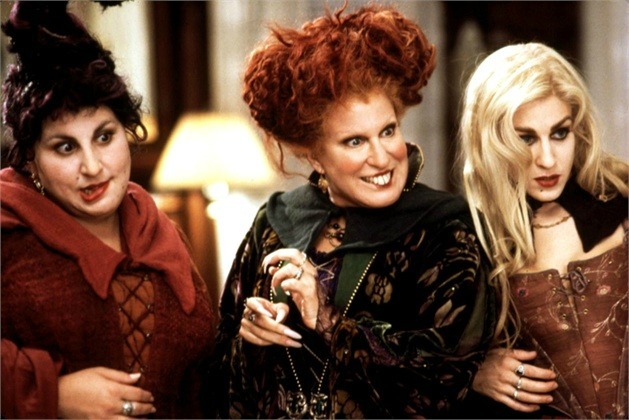 I hold Hocus Pocus near and dear to my heart. It’s one childhood movie that I can watch now and have the same feelings I did when I was a kid. Not to mention, when I watch it now I still learn even more life lessons. Learning life lessons from Hocus Pocus seems silly, but hear me out. Life lessons can start with the Sanderson sisters (the witches). They are confident, powerful and true to their identities. The sisters know who they are, what they want and they are not going to fall for the pressure of society. They hold strong and true to themselves the entire film. Yes, they are portrayed as evil, but they are awesome because of their trials and tribulations. Lesson two: embrace your appearance and quirks. They are witches we love for far more than their appearances (even though they are called ugly a few times). Winifred is the smart and tough. Sarah is ditzy and boy-crazy. Mary is a peacemaker who is goofy and brings everyone back together. With such drastic personalities, like sister’s have, they work together to solve problems. It is evident they are comfortable with themselves even though they have quirks. Embrace your appearance and quirks. That’s a message worth hearing, and a spell that’s worth being under. Lesson three: family will always be by your side. When you expect it least, your family will always pull through. You can see this lesson several times in the duration of the movie. The witches are always together and helping one each other fulfill their goal. Sure they get off task a few times, but they have their eyes on the prize and nothing is going to stop them from getting to it. The Dennison’s are always together. Though it was Max’s fault for bringing back the witches, he has the help of his sister. They stick together and are always positive. As you can see this movie is good for all ages and audiences. Watching it now, I have a new appreciation and found more love for it. I can’t wait for the next time I can sit down and watch this movie with my mom and sister. Here’s to the 20 year anniversary of an excellent movie. Getting back to reality isn’t exactly my problem, work is. After taking a long vacation, especially and international trip. It is always hard to get back into the swing of things. Personally, I find it even harder to get back into your work-life groove. While you were gone so much has changed, people got hair cuts (haha), you missed countless staff meetings, dodged those crazy phone calls, and even have a stack of emails that you are still trying to catch up on after a week of being back. All you can ask yourself is: will it ever be the same? Here are a few tips and trips to tackle your post vacation blues and get back in the game when it comes to work. Once you get back you will need a lot of sleep. When traveling and on a vacation, you hardly sleep. In my case I was international, so I am dealing with timezone changes. Which brings me to relaxing! When you are on vacation, you put so much effort into catching up with friends, checking out all the hot spots, and going above and beyond what you would normally do. You want to make this a trip of a life time, so relaxing is not on the docket. Now that you are home, you have to go to work, and reality sets in. Make sure you add in some relaxation time the first few days after being back from a long trip. It’s hard to see 415 emails piled up, 9 missed phone called and a million papers on your desk. You need to make a to-do list. Figure out what needs to be accomplished first and what can hold off. At staff meetings, take notes. During regular meetings take notes. Maybe it’s not your thing to take notes during meetings, because it’s not mine; however, I make sure to take as many notes as possible post vacation. My mind is running around trying to figure out a thousand different things, that these notes during any meeting are critical to my success. This is a big one: talk to people. I’ve been engage in conversations I normally wouldn’t be. I want the dirt! I want to know what was happening while I was gone and how I can help with others. I want to see how other people can help me and who is also working on my projects. Make sure to talk with everyone to see what they have been doing and they will be of any help on your upcoming projects that are due. I hope these tips and tricks help you once you come back from a vacation. They are really helping me to get through this week. And think…I am almost caught up and it’s almost Friday! #TGIF!